Diane Vega's sister JoAnn took a hold of the white ghost bike and took it out of her car. A few moments later, there it was -- another ghost bike standing at the side of the road in Tampa. This time, the street corner was Himes Avenue and Spruce Street, a blue-collar neighborhood intersection where the family and friends of Diane Vega held a ghost bike dedication in the memory of Diane. Diane, 53, was killed at the street corner Oct. 1 when she stood on the sidewalk waiting to cross with her bicycle. A car blew through a red light and created a car accident that ended with a vehicle killing Diane. A little after 1 pm today, I joined a group of some 20 of Diane's friends and family to remember the beautiful woman, say a prayer and hope we won't have to install any more ghost bikes around Tampa Bay. Kudos to Michelle Calonge at Joe Haskins bike shop in Tampa where the ghost bike was made in Diane's memory. The St Pete Times did this story on ghost bikes in today's paper. The Bicycle Bash festival will be situated in beautiful Flatwoods Park. The Bash will take place at the old grassy and paved parking lot next to the 7-mile paved loop and a mountain bike trail, at the "Y" water station. 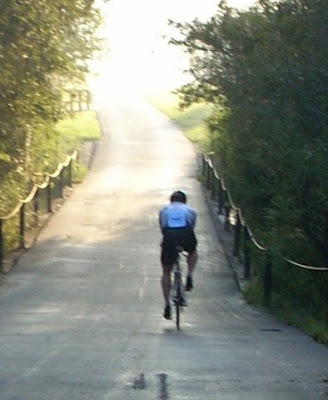 Imagine cycling on either trail and visiting a Bicycle Bash exhibitor withion seconds -- you're that close. But parking is limited inside Flatswood Park to Bicycle Bash exhibitors and Cure on Wheels riders. So, where to park your car? 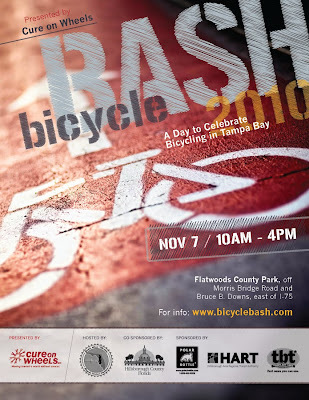 First, try and ride a bicycle to Flatwoods and the Bicycle Bash. If you drive a car, no problem. SWFBUD and Hillsborough County has set up a remote parking lot on Morris Bridge Road at Branchton Park, just south of the Cross Creek Blvd. intersection. You can take a free shuttle bus ride right to the Bicycle Bash. You can also park your car at Branchton and ride a bicycle to the Bash if you bring your bike. And if you have kids and their bikes, children will be allowed to bring their bikes on the shuttle buses. It's less than 10 days to the Bicycle Bash at Flatwoods and SWFBUD has assembled a nice roster of exhibitors and vendors. SWFBUD STORES: Bicycle Outfitters, Just Ride Bicycles, Trek Bicycle Store, Suncoast Trailside Bicycles, Carrollwood Bicycle Emporium, Oliver’s Cycle Sports, University Bicycle Center, Chainwheel Drive, The Ironman Store, Street Fit 360. SPONSORS: Cure on Wheels, presenting sponsor; Hillsborough County, co-sponsor; HART, tbt* and Polar Bottle, sponsors. Mix 1 Life energy drink. GROUPS: Prodigy/University Area Community Development Corporation, SWAMP, WalkWise, Tampa BayCycle, Tampa Bay Freewheeleers, Hillsborough County MPO, USF Bike Club, Tampa Police, Florida Bicycle Association, City of Tampa Trails, Hillsborough County Public Works, Trips For Kids, All Children's Hospital (giving away free kids' helmets). SWFBUDDY Award Winners: Tampa Police Maj. John Newman, HCSO Cpl. Troy Morgan, Ed Collins, State Rep. Janet Cruz, Selena Glass, Tampa Councilwoman Mary Mulhern, Christopher Chow. It's a trend I hope will stop. Another ghost bike is being placed along a Tampa Bay road. This time, the white memorial ghost bike is going up at the corner of Himes and Spruce where bicyclist Diane Marie Vega, 53, was killed on the way to her job Oct. 1. A car that ran a red light caused a crash that led to the death of Diane, who was standing on the car waiting to cross the road with her bicycle. The ghost bike in memory of Diane will be installed tomorrow, Oct. 30. 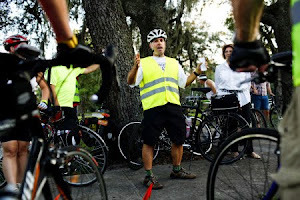 Jack Sweeney, the Ghost Rider of Seminole Heights, tells me that folks from the Seminole Heights Bicycle Club and Bikecommuters.com are partnering up to host a NOV 7 group ride out to Flatwoods Park, home of the 2010 Bicycle Bash. Jack says riders will meet at 8 AM and roll out promptly at 8:30 from the Seminole Heights Garden Center, 5800 Central Avenue in Tampa. From Flatwoods, the group will leave for the return leg to the Garden Center at 2:30 PM from the SHBC tent. Distance will be roughly 40 miles roundtrip at a pace of 15-17 MPH. As with all rides hosted by Bikecommuters.com and SHBC, helmets are strongly encouraged. See you there! And many kudos to the folks at Florida Cycling Magazine for a nice Bicycle Bash preview in the current edition that arrived at my email this afternoon. Hey Joe Maddon, you're not the only Major League Baseball manager bicyclist around these here parts in Tampa. May I introduce you to Tampa bicyclist Sweet Lou Piniella -- former manager of the Cubs, Devil Rays (yup, they were called Devil Rays when Lou managed them), Mariners and Reds. My neighbor Eddie Escobar, a massage therapist a few doors down, told me he met Sweet Lou while they were both pedaling their bicycles on the Suncoast Trail recently. Eddie, a lifelong Tampa man, told Lou that he knew his brother and Eddie also passed along condolences to Lou for losing his mom in the past year. 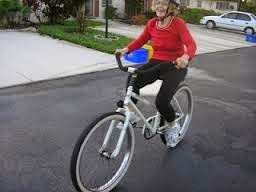 Eddie said Lou was riding a hybrid-style bicycle on the trail and appeared to be enjoying the retired life. No better way to be enjoying retirement that by riding, that's for sure. Keep riding, Sweet Lou! Seminole Heights is a special neighborhood in Tampa -- and one of those reasons is the always popular kiddie pumpkin parade before Halloween. Kids of all ages -- and I mean all ages -- show up to stroll around Lake Roberta, get photos with the local fire station truck and munch on cookies afterwards. I rolled out the Bicycle Bash billboard trailer and served as sweeper, along with the firetruck. It was nice to see my Seminole Heights pals such as Rich Mullins, Jack "The Ghost Rider" Sweeney, Florence and her two canines, neighbors April, Mike, Laura, Brian and Liz and their kids. Two of the finest forms of transportation right there. That's no phony Halloween doo-doo -- that's the real manure. Cyclists, beware that road hazard whil biking around Lake Roberta. 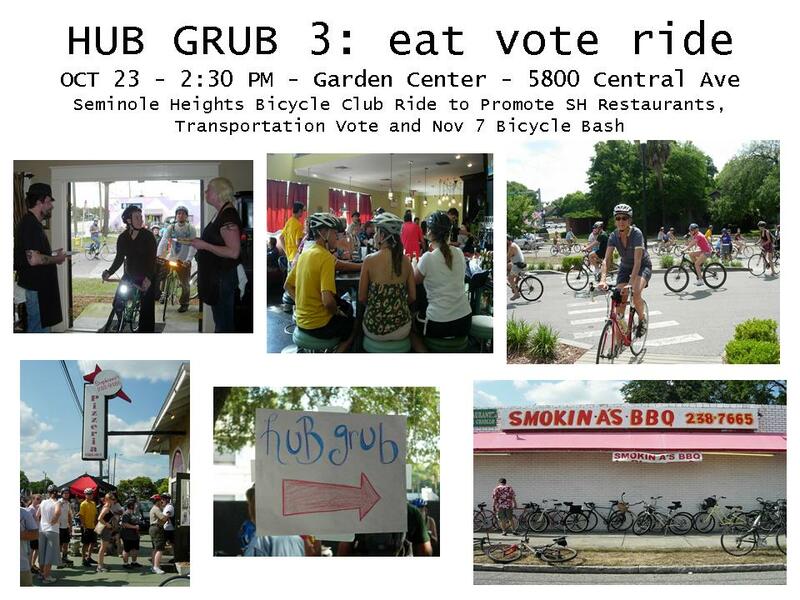 Sixty hungry bicyclists -- along with some 10 Tampa police officers -- pedaled the streets of Seminole Heights as we visited six local restaurants for Hub Grub 3: eat vote ride. So many thanks to go around for making this afternoon's HG3 such a delightful ride. Tampa Police were great -- led by Chief Jane Castor, Maj. John Newman and a host of other officers such as Cpl. Tom and Eddie Croussant. Thank you restaurants -- Nani's, Viitals, Stephanno's, Ella's, Independent and The Refinery. Thank you Moving Hillsborough Forward for meeting bicyclists at the start. Chief Castor attended the start and the District 2 staff under the leadership of Maj. John Newman were incredible. District 2 rocks -- Thank you Tampa Police. Nani's: A great sample buffet! Thank you Nani's! Viital's Bakery: Ivan met the bicyclists and talked about his organic baked goods. Stephanno's Pizzeria: Justin did a great job baking up garlic knots and offering pizza. The Independent: We missed Veronica but that didn't stop people fronm having a few beers. The Refinery: Michelle had a homemade chocolate and bacon cookie -- and oatmeal cookies too -- ready for the cyclists. Her husband Greg was chef of the year in Creative Loafing and I'd say chocolate and bacon is one helluva combo. Jared ran with his baby daughter Kalina while Tanja did the conventional bicycle. St. Pete Times columnist Sue Carlton came through with a nice column today about how the transportation initiative will help bicyclists in Hillsborough County. Hub Grub 3 -- eat vote ride is set for Saturday at the Seminole Heights Garden Center, 5800 Central Ave., Tampa. The ride will also include promotions for the upcoming Bicycle Bash on Nov 7 at Flatwoods Park and bicycle transportation talk courtesy of Moving Hillsborough Forward. Moving Hillsborough Forward will be handing out free water and materials at the start. SWFBUD is proud to announce that seven individuals in the Tampa Bay area will be receiving SWFBUDDY Awards for their help to make the Tampa Bay area more bicycle friendly and to raise awareness about bicycling. The SWFBUDDY Awards will be given at 12 noon during the Bicycle Bash festival on Nov. 7 at Flatwoods Park. -- Maj. John Newman of Tampa Police, District 2. Maj. Newman deployed electronic message board signs showing bicycle safety messages in District 2 locations such as Bruce B, Downs Blvd. and in Seminole Heights. Maj. Newman also deployed bicycle officers to help keep the Hub Grub Bicycle Ride bicyclists safe during bike rides. -- Cpl. Troy Morgan of Hillsborough County Sheriff's Office. Cpl. Morgan also deployed portable message boards with bicycle safety messages on main county roads such as Fletcher Avenue and North Dale Mabry Highway. -- Tampa City Councilwoman Mary Mulhern. Councilwoman Mulhern was instrumental in getting her fellow council members to approve the creation of a bicycle safety action plan in light of seven Tampa Bay bicyclists who have been killed in a 2 1/2-month period. Councilwoman Mulhern also got her council to agree to staging a bicycle safety workshop. -- State Rep. Janet Cruz. Rep, Cruz has thrown her support behind a proposal to build a paved bike trail along the By-Pass Canal from Morris Bridge Rowd to Tampa and was the sole elected official to appear at a Memorial Bicycle Ride on Oct. 1 to remember those bicyclists who have been killed recently in Tampa Bay. -- Ed Collins. Ed showed great leadership to voice his support for bicycle safety reform after his dad, Admiral LeRoy Collins, was killed while bicycling in Tampa on July 29. Ed appeared before the Tampa City Council and spoke at the Memorial Bicycle Ride on Oct. 1 to call for improved bicycle conditions in Tampa Bay. -- Selena Glass. Selena showed great courage on Oct. 1 when her mother, Diane Vega, was killed while bicycling to work early in the morning in Tampa. Fourteen hours after her mom was killed, Selena met bicycle riders returning from a memorial Bicycle Ride in Tampa while carrying a lit candle to remember her mother. -- Christopher Chow. 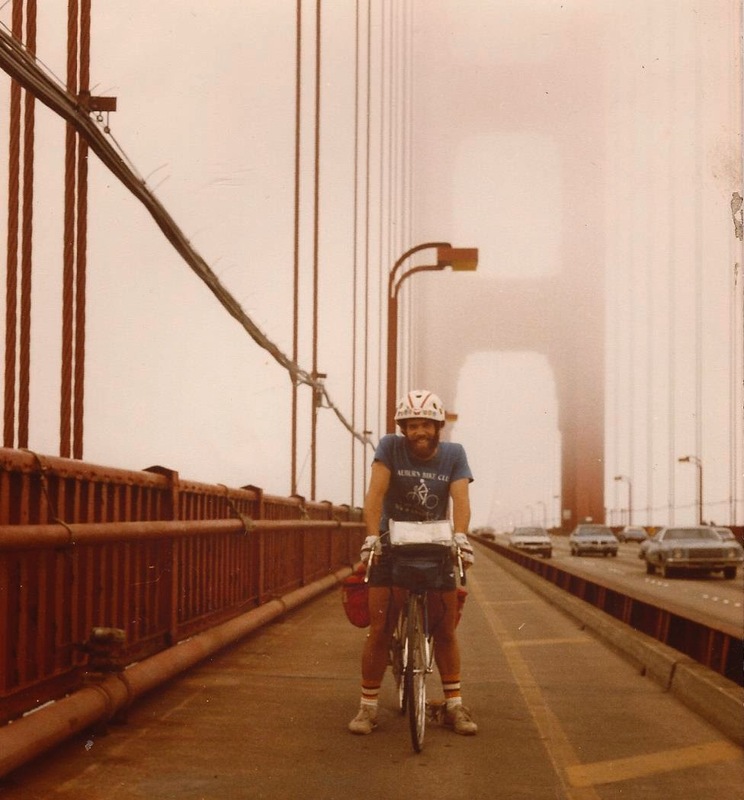 Christopher showed great love for bicycling when he organized a bicycle memorial and ghost bike for bicyclist Kayoko "Kay" Ishizuka, a USF health researcher who was killed by a hit-and-run driver on Bruce B. Downs Blvd. near USF on Sept. 25. 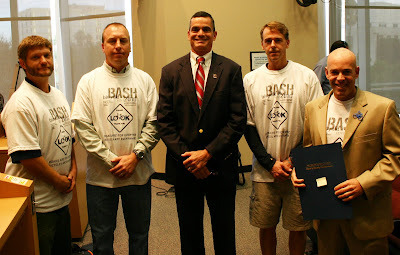 Hillsborough County Commission this morning proclaimed NOV 7 as Bicycle Bash Day. Thank you Commissioner Mark Sharpe, for leading the charge to create a bicycle safety action plan in the county. 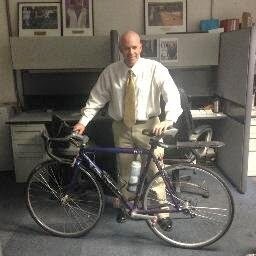 The Tampa City Council will be voting tomorrow on a resolution to have a bike action plan in the city. Attend and tell the city council members that Tampa needs to be bicycle-friendly. An arrest in the hit-and-run bicyclist death of Kay, the USF researcher and bicyclist. This morning on the way to meet Shelton Quarles to film a bicycle PSA for the Bicycle Bash I stopped at the corner of Himes and Spruce, where bicyclist Diane Vega was killed Oct. 1 while biking to work. This memorial pays tribute to Diane. I also know a ghost bike is being made in Diane's memory, too. Shelton Quarles has an important message here. Shelton, former middle linebacker for the Bucs and a bicyclist, advises people to share the road. 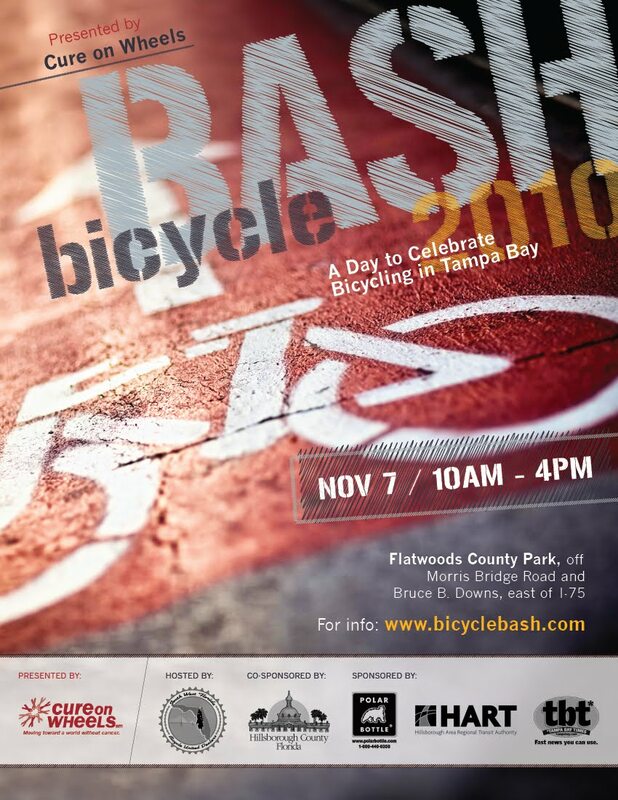 Thank you Shelton Quarles, former middle linebacker for the Tampa Bay Bucs, for sharing your time this morning to tell folks to come to the Bicycle Bash at Flatwoods Park on NOV 7. 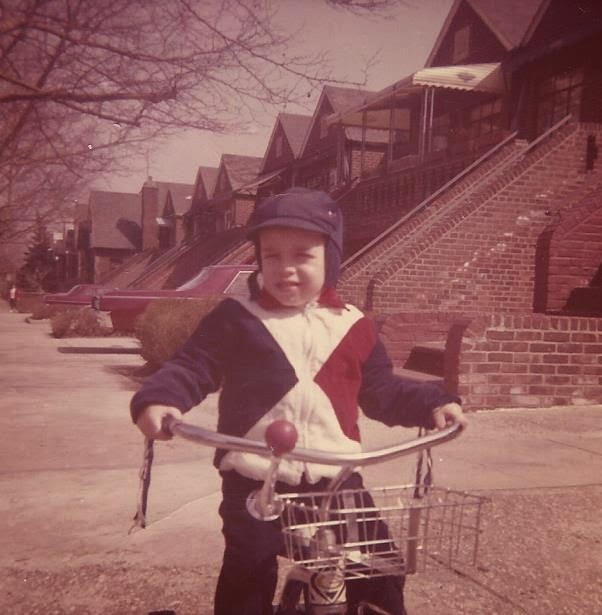 Shelton and his family love to ride bicycles. Manny Mirabal, owner of University Bicycle Center, forwarded this email from Christopher Pardo and Gail Clark of the Tampa Bay Velo Club. Would you like to see this headline? We would and we are reaching out to you for your assistance to make this happen. We believe that the residents of Tampa Bay would benefit from a velodrome and bicycle park. Our plan is to approach our city councils with the construction of a park that would include a velodrome, criterium/time trial course, BMX track, and easy access to an area bike trail. There are slightly over 20 velodromes in the United States . The closest one is near Ft. Lauderdale . The next closest is Atlanta . Our central location would draw participants and fans from our neighboring counties, Orlando , and Ocala . This velodrome and park would provide a venue for professional, amateur, masters, and youth racing. These tracks would provide our universities, colleges, and clubs with a safe place to train and could promote the expansion of intercollegiate competition. The facilities could also be used for time trial training, bicycle safety training, in-line skating, wheelchair racing, and even remote control car racing. Events could compliment local triathlons and other sporting events. The velodrome in-field could be used for swap meets, parties and music events to benefit charities. The appeal of cycling for fitness continues to draw new members. This park would introduce our youth to the sport within a safer environment than the street. Overall, the park will promote health and fitness for all ages. As cycling comfort levels grow, cycling to work becomes more of a reality having a positive impact on the environment. To help these grassroots efforts, we are looking for feedback and recommendations. Do you agree that our community would benefit from a velodrome and bicycle park? Do you know individuals that would be willing to help quantify and expand community interest, estimate costs, or formalize a proposal for city council acceptance? Do you happen to have experience in velodrome design or operations? Do you have contacts within a local college/university that could help perform an economic impact analysis? Below are a few links to other velodromes and parks around the county. A handful are currently in various phases of development. Colorado is on their third. We look forward to hearing your thoughts about this endeavor. Thank you for your time. creating an attractive destination for new residents, tourists and businesses. the creation of a bicycle safety action plan for use within the City of Tampa. Section 2. That this resolution shall take effect immediately upon its adoption. It's hard to find a sharper-dressed veloman than Jack "The Ghost Rider" Sweeney, my fellow Seminole Heights bicycle man. Tonight he swung by SWFBUD headquarters to pick up his reflective sharrow safety vest, which Jack plans to use for night riding and even on the job. SWFBUD is working with Caleb's Creations on these sharrow vests and look for Michael Ploch of Caleb's Creations at the Bicycle Bash on NOV 7 at Flatwoods. Kay's ghost bike at sunrise this morning during a ride today. This morning I represented SWFBUD at the Four Green Miles running race at Al Lopez Park, where I joined Steve Ellis and the Publix Greenwise promotions crew which gave away free bananas, organges and ice tea. I met Steve at a clean air event in downtown Tampa several months ago and he invited me to hang with his crew at the road race today and hand out Bicycle Bash fliers and bicycle safety booklets and materials. Steve gets bicycle safety and importance of bicycling in the Tampa Bay area. It was a pleasure to hang with Steve's Publix Greenwise crew. 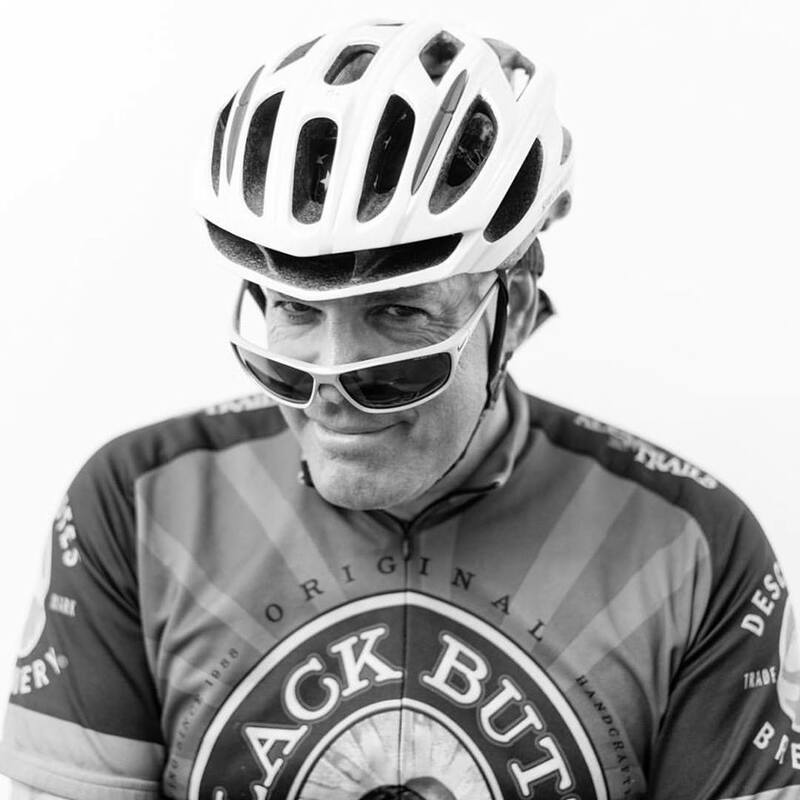 Steve is a great guy and would like to team up on future bicycle events. Contact me if you'd like to but a sharrow reflective safety vest. Proceeds will help local bicycle advocacy. 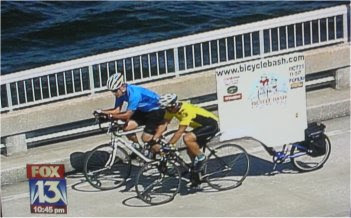 It's that time of the year -- time to roll out the world-famous Bicycle Bash billboard trailer to promote the Bicycle Bash. On Saturday, I will be biking the buillboard trailer to Al Lopez Park in Tampa where the Four Green Mile road race is being held to raise money for the National Osteoporosis Foundation. I will be at the Publix tent and table hanging with my friend Steve Ellis of Publix and handing out Bicycle Bash fliers and bike safety booklets. I will be there from 7 AM to 12 noon, so stop by and say hey.